A cold front is pushing on in, albeit a touch slower than modeled previously, bringing with it the first taste of winter as showers transition over to snowflakes. Radar up above shows that transition taking place to our north. Temperatures locally are still quite mild -- 50ish as of this early hour throughout Southeast Pennsylvania, with the front generally residing along Blue Mountain through the state. Temperatures at 2 AM dropped quickly to 40 in Mount Pocono, into the 30's by the time one reaches Scranton. In Mount Pocono, the temperature between 2 and 3 AM dropped from 41 to 31. That colder air will drain south through the morning hours, although the timing is such that we will see the cold slink south probably closer to the start of the morning rush. Regardless, it won't be *this* warm in a few hours and we won't see temperatures get back to this level this afternoon. 2 AM temperatures. Won't be this mild later on around here. 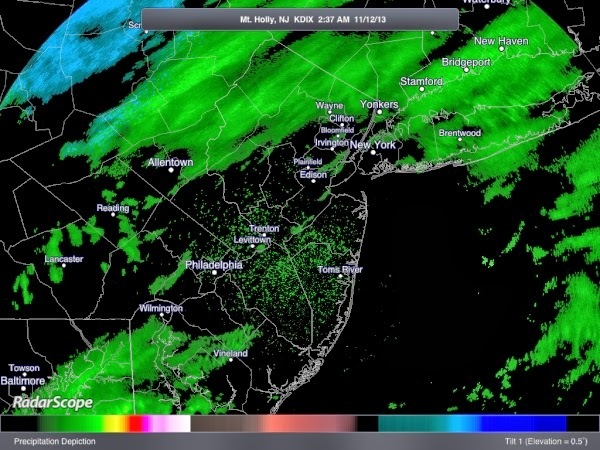 A band of light snow, as depicted in the radar shot up above, is pushing south in the wake of the frontal boundary passage. That band of snow is relatively solid through the middle of Pennsylvania at this point but is modeled to break up a little bit as it pushes southeast. It should hold together for this end of the state to bring a period of snow showers or steady light snow after 6 AM, although it will probably start as light rain before transitioning over as colder air works in. If you look at the High Resolution Rapid Refresh (HRRR) below, you can see the transition from rain (green) to snow (blue) modeled along I-95 for the 10 AM hour on the model. Timing probably is within a couple of hours, mainly on the earlier side, of that model point (8-10 AM in the city). HRRR for 10 AM. Blue areas are snow. Green areas are rain. Coating type accumulations on lawns are possible, especially to the west and northwest of the city. It doesn't look like we'll see much more than that as it moves through. That said, many of us should see our first flakes, albeit for a brief period of time, as the cold front pushes south and drags a taste of winter in with it.